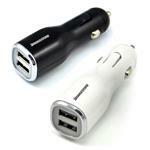 A dual port USB car charger for both smart phones and tablets! This adapter has dual ports and a LED ring that would illuminate white light while plugging into accessory power outlet to charge personal devices. 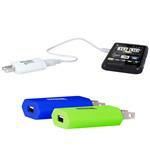 Compatible with smartphones and personal devices that provide USB cable for charging (including iPad and tablet devices). Input: 12-24 Volts. 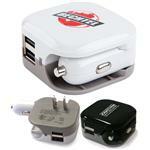 Two USB Ports(5V/1 Amp & 2.1 Amp), Max Output: 2.1Amp. USB cable not included. Input: 12-24 Volts. 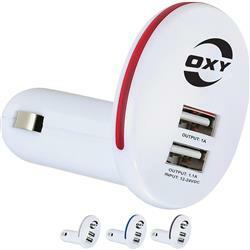 Two USB Ports(5V/1 Amp & 2.1 Amp), Max Output: 2.1Amp.